I was proud to represent the buyers in their purchase of this new custom home built by Bainbridge Island Builder Bob Grimm. And, the buyers were thrilled to move into their beautiful home before Christmas. Special thanks to Tom Rees at Bainbridge Island Mortgage and Julie Cottle at Pacific Northwest Title for their excellent professionalism during another successful transaction. Contact me for more info on this sale . . . or other homes you might be interested in. On Tuesday, my daughter’s classmate, Ian, had open heart surgery at Stanford Medical Center. Ian’s surgery was required to graft a new pulmonary artery and valve. Ian had the surgery at six weeks old to create the pulmonary artery he was missing at birth, but now at six years of age, he had outgrown the artery and valve he received as an infant and was in need of a new one. We knew that he might be getting this new, larger graft from a bovine, a pig, or, the best case, from a human donor. Through the technology of CaringBridge.org, we have been keeping track of Ian’s hospital stay and surgery via his mom’s journal updates. He has been on our minds all week, especially the crucial day of his surgery. His surgery was scheduled for early on Tuesday morning, but it was delayed and delayed again. Late in the afternoon on Tuesday, starving, because he had not eaten since 8pm the night before, Ian went into surgery and again we waited for an update. At about 7pm, we got word through his mom’s journal that the surgery went very well. His mom also added, gratefully, that his heart graft came from a human donor and asked for us all to give a word of thanks for that invaluable donation. I could not hold back tears as I read the update and then shared the good news with my two girls. I have been an organ donor since I got my license, but only now as I have gotten older, and had children, do I fully realize how incredible the miracle of organ and tissue donation is. One single organ and tissue donor can save up to 100 lives. We are all very happy that Ian, this little boy in our life, in our community came through – with flying colors, this monumental surgery . . . especially on the heels of Christmas. But, the success of this surgery was made possible, in part, because someone else chose to gift their organs, to gift life after an untimely death. That someone else, who donated part of their heart, had their own life, was another person’s child, was part of another community. It is times like these that make me realize how closely connected we all really are. Working together, your community and my community make each other possible. With today’s unbelievable medical technology and human compassion . . . we are really, quite lucky. What Ever Happened to those Century 21 Blazers? I could use one of those about now. I generally have a problem with uniformity; however, if it solves decision making problems on dark winter mornings and eliminates clothes shopping . . . sign me up. If you know me, you know I do not love to dress up. I was a questionless proponent of casual Friday. I love jeans and I have a fleece addiction. REI and Patagonia do not really have a professional attire department, so I struggle. I experimented with the corporate/casual wear at The GAP, J.Crew, and Banana Republic, until I realized those clothes are really for 24 year old professionals with no body fat. Luckily, I found Ann Taylor and more importantly, I discovered her Loft where she hides all of her less expensive apparel. Ann Taylor makes clothing that fits my body, which is a really good thing. Ann also realized she could sucker me in to her clothing line by redoing her sizing. For years I was a size 6, now, thanks mostly to Ann, I am a 2. However, 2 or not, I still have to shop. Things got a bit easier a few years ago when it occurred to me that I could use mannequins and just replicate the ensembles. Wow. Of course, that’s what those headless things are for. The headless gals have helped me some, but shopping still takes so much time . . . and the wearing of nice clothes takes time – all the ironing, the dry cleaning, the matching, the accessorizing. I am a simple girl; I struggle. So, the simple blazer, gold and ugly as it may be, would be so easy. Perhaps it is time for the rebirth of the iconic blazer that sadly faded away with the 80’s. I wonder what it would look like in fleece? The Bainbridge Island Musical Fire Truck is getting into gear – it starts tonight and goes until Christmas Eve. Find your neighborhood on the map below (click map for larger version). The truck is out in the evenings from 5-9pm. Last year we had snow when they came through our neighborhood – my kids are hoping for a repeat performance! If it were up to my six year old . . .
this is what our Christmas tree would look like. For now, ours is the Evergreen Style, and this one is sitting proudly in the window of Kennedy and Kate in downtown Winslow. 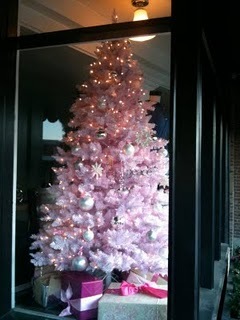 Buy local and enjoy the amazing window displays downtown. Below is part of the award-winning display for Churchmouse Yarns and Teas.